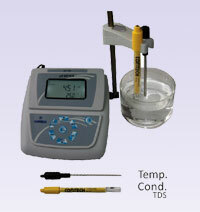 Contech, the pioneers in Laboratory Balances has added high quality laboratory equipments like pH Meters, Conductivity Meters, DO Meters, Polarimeters, Refractometers, Melting Point Apparatus to the existing range. Vast experience and in depth knowledge of Laboratory needs and instrumentation has helped Contech to roll out these most advanced technological products. 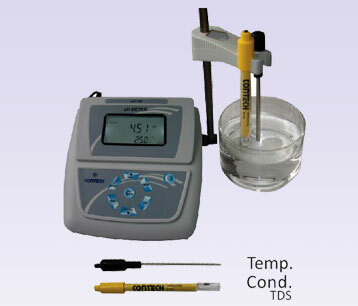 Incorporates advanced automatic frequency convertible and voltage technology to enhance electrode’s measuring capability and maintains the electrode constant in standard solution of different concentration. One point calibration for the entire range. Display of Conductivity & temp on backlite LCD. Entry of Conductivity electrode constant, machine ID through keyboard for the GLP print out.